(Nanowerk News) Carbon nanocoils (CNCs) composed of helical shaped carbon nanofibers have potential applications including mechanical springs and nano-solenoids. There are some reports which measure the spring constant of CNCs. However, the CNC response to prolonged stretching, which includes initial elastic elongation to large-scale deformation in the plastic regime and subsequent tensile fracture followed by post-fracture contraction and the release of the applied strain, remains undetermined. It is crucially important to secure real-time measurements of CNC deformation beyond the linear elastic regime. Here ("Real-time deformation of carbon nanocoils under axial loading"), Taiichiro Yonemura and colleagues at Toyohashi University of Technology describe the real-time deformation data that exhibited sequential change in CNC geometry after each coil was subjected to a uniaxial load at a constant rate. 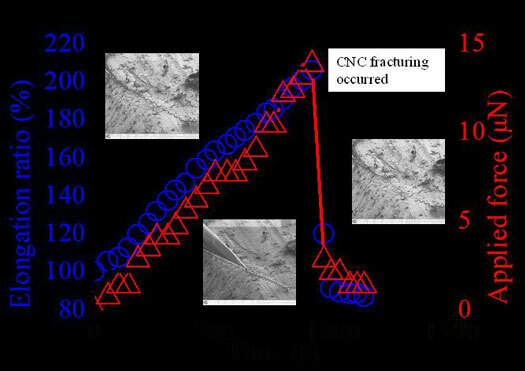 CNC tensile tests were conducted as follows: The CNCs were installed into an FIB system with a tungsten (W) probe with a 500 nm tip diameter and the W probe moved until it adhered to CNC using Pt ion beam whereas the Si ion beam cut the CNC bottom; then the CNC-adhered W probe approaches a spring table substrate surface, until the CNC was almost perpendicularly to the substrate. The tensile tests were performed on nine CNCs by gradually changing the distance between the substrate and W probe. The real-time data of a CNC tensile test performed using a spring table in the FIB chamber was monitored. A series of three scanning ion microscopy (SIM) images offers visualization of the geometric evolution of the CNC under a tensile load. These images were captured in the free state (t = 0 s), the maximum elongation point (t = 910 s), and a post-fracture state (t = 960 s). To determine the elastic boundary of the CNCs, we examined the relationship between the applied strain and residual elongation ratios of CNCs after the load release. The result indicates that the CNCs were in the elastic region for elongations up to approximately 15% strain. Tensile tests, performed on nine different CNCs, revealed that the average CNC spring constant was 1.8 N/m. Using a theoretical equation for the design of macroscopic springs, the shear moduli of the nine CNCs were estimated to be 6 GPa on average. These results may serve as a milestone for developing CNC-based applications in the future.